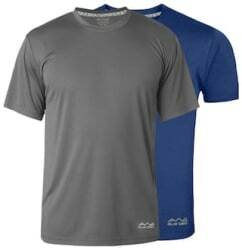 Dress up to excite with this good and suavey T-Shirt from AWG - All Weather Gear. Weave your magic when you wear this fresh solid T-Shirt. The refined silhouette of this half sleeves T-Shirt makes it long longstanding and handsome. This round neck T-Shirt has a perfect fit to accentuate your body type. Keep it natural yet polished in a multi-colored men s T-Shirt. An breezy polyester T-Shirt optimal for people who adore walking under the hot sun. Couple this T-Shirt with cargo pants and cap-toe brogues.